Professional editing is a business. If it were a hobby, it would not matter whether or not we made a profit because we would be pursuing editing purely for our love of editing. Yet, for most of us, editing is a business, and as a business we need to be concerned with profit and loss. Even businesses that are organized as nonprofits need to be concerned with profit and loss. The difference between a for-profit and a nonprofit business arrangement is that the former distributes any profit to its “owners” whereas the latter uses any profit to further its goals (i.e., there is no distribution to owners because there are no “owners”). A business cannot make a profit if it does not generate income in excess of its costs of doing business. It’s a simple concept but one that seems to be just outside the grasp of many business owners. Knowing whether we are making a profit or suffering a loss is important to editors because we, just like all other businesses, need to constantly evaluate whether what we are doing is worth continuing to do. If we are not making a profit and if we cannot adjust what we are doing so that we do make a profit, perhaps we need to pursue a different career path or conduct our business differently. Tracking one’s effective hourly rate (EHR) is a way to determine the health of one’s business. It is also an alert system to tell us if and when we need to make adjustments in how we operate our business. If we know, for example, that no matter what we do, our current client base will not pay a rate higher than $20 an hour (or its equivalent), and if we know that our EHR, as we are currently operating, needs to be higher than what our client base is willing to pay (the required EHR), then we know that we need to make adjustments in how we conduct our business. This is the critical and most important reason to know and track the EHR. When we operate without knowledge of our EHR, we assume that if we bring in $1,000, it represents mostly profit. This is the allure of the hourly rate: an hourly rate makes us believe that we are earning a decent income because we are assured that for every hour we work, we earn that hourly rate. In real-world business, however, it is not so simple. Editors, like all businesses, have a production line. I know we do not like to think in those terms, but the fact is that we do operate a production line. (A “production line” is not synonymous with “assembly line.” Production line refers to the manner and order in which we do our work.) We receive a manuscript and we take certain steps in dealing with the manuscript, steps that we repeat with each project. For example, the first thing we may do is clean up the file to remove extraneous elements like extra spaces. Then we may break out reference lists from the main text, or put figure legends in a separate file, or insert bookmarks, or whatever. Ultimately we get to the editing phase, but it is rarely the very first thing we do. As part of our production line we may do multiple passes. We may do a rough edit, then a second edit, then a cleanup, then a final pass to search for anything we may have missed. What exactly each of us does is not as important as that we recognize we have these steps and that we can articulate them. The articulation is important because part of what we need to do if we are not making a profit is determine what steps in the production line can be omitted or modified so as to make the step more efficient. One publisher, for example, looks for the least-expensive editor who meets certain minimal qualifications and then provides a multipage checklist of things it expects the editor to do. There are several interesting aspects to the list, one of which is the blurring of the roles of the developmental editor and the copyeditor. The publisher expects copyeditors to fulfill both functions for one very low price. In addition, the publisher has its own style. which differs from standard styles in small, subtle ways. However, failure to comply with the publisher’s house style results in requests for the editor to repeatedly go over the manuscript to fix it for no additional fee. Faced with not earning the EHR, an editor has to determine what changes can and must be made in the editor’s production line in order to earn the EHR. Will, for example, eliminating a second or third pass over the manuscript reduce the hours sufficiently to raise the EHR? Will changing the production line to a single-pass process do the trick? What other adjustments can be made that will result in increasing the EHR? Or does the editor need to drop this particular client? Can the editor afford to drop this client (i.e., how easily can the revenue this client generates be replaced)? The reason to bother with calculating and tracking the EHR is to create a foundation for making business decisions. Bringing in revenue of $50,000 a year is nice, but meaningless, if we do not know what our cost of doing business is or whether the procedures we follow are hampering, increasing, or having no effect on our profitability — or even how many hours we need to work to make that income. It is also meaningless if we do not know whether doing work for a particular client is profitable. If working for a particular publisher is not and cannot be profitable, should we not know this so we can decide whether or not to drop the publisher and find other clients? Perhaps even more importantly, bothering with the EHR lets an editor determine how well the editor is doing over time. Is the editor’s speed and efficiency and productivity increasing or decreasing or remaining stable — month to month, year to year? The EHR also spreads the earning requirements over the full work week, thus accounting for the nonbillable time we need to devote to business, such as for marketing. It also is (usually) a rate we can more realistically expect clients to accept. More importantly, unlike an hourly rate, the EHR forces us to think in terms of a business week and not just in terms of billable hours. Too many small business owners think that the only hours that are part of the business calculation are the billable hours, which is incorrect. Finally, the EHR, unlike an hourly rate, lets us fully measure productivity and efficiency. The more productive and efficient we are, the more often we exceed our EHR. When we charge by the hour, we can never exceed that hourly rate. The EHR is foundational information that acts as a guide to business decision making. It is something against which a business can measure what the business is doing and determine whether the business is on the correct path or needs to alter its course — making calculating the EHR worthwhile. The effective hourly rate (EHR) discussed in parts I, II, and III, is based on a 40-hour work week. The calculated EHR is what is needed to be earned each hour of that 40-hour work week. This does not mean that you must have 40 billable hours, just that this is the EHR that each hour has to earn even if the earning has to be compressed into 20 billable hours. I did not take the calculation to the final step, which is determining the actual hourly rate. I assumed that readers would be able to make that final step themselves. I have been using the EHR for so many years that what to do seems obvious to me, but in reality, it is not so obvious — as readers have pointed out — and so that is the topic of this post: How do you calculate the actual hourly charge? For purposes of this example, let’s change the dynamic a bit. Although we’ll retain the $30 per hour charge, the 20 billable hours per week, and the 40-hour work week for purposes of calculating our current net EHR, let’s make our expense number a more realistic $4.60 per hour (based on these monthly expenses allocated to the business: rent/mortgage = $500; heat, water, and electric = $200; telephone = $40; and maintenance = $50). This changes our net EHR to $10.40 ($15 gross EHR − $4.60 expenses) based on a 40-hour work week. Although some readers think we only need to pay attention to billable hours, that is not true. It is true that in a 40-hour work week we do not bill for 40 hours; we do have administrative matters and marketing, for example, that need to be addressed for which we cannot directly bill a client. But these are no different from the rent. They need to be paid for and every business calculates what it needs to charge customers by including time spent on nonbillable matters. The same is true for sick days and vacation time. These items are part of the expense of doing business; we just cannot give them precise numbers like we can give rent. Consequently, the hourly charge that we determine accounts for the facts that we have only so many billable hours in a week and we also have hours in the week that we have to devote to nonbillable matters. If we were to use the net EHR we calculated ($10.40), your average weekly earnings, after expenses, would be $416 or a yearly income after expenses of $21,632. But our goal is for that yearly income to be $50,000. Now you know what you have to bill per hour to have a net annual income of $50,000 while having only 20 billable hours a week. Your question is: This number can be calculated without calculating the EHR, so why go through the trouble of calculating the EHR? Why not go to the heart of the matter directly? The answer is that few of us can directly charge the hourly rate we need to earn. 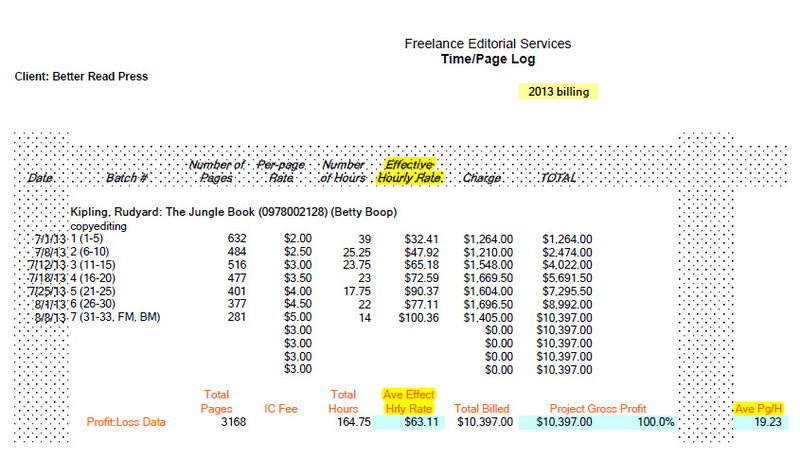 How many of your clients would knowingly pay you $60 an hour for copyediting? Most of us have difficulty transparently charging and collecting that amount, especially if we work for publishers. That is why we began this series with the hourly charge of $30. We need to calculate the net EHR to see what we are really earning under our current charging scheme. Most of us see that this week we brought in $600 and the week before we brought in $900 and last year we had a gross income of $41,628. And we also see that when it came time to pay the rent, we paid it, even if we struggled to do so — the same being true of our other bills. But few of us really know what we are really earning, and in the absence of knowing that, we have no foundation on which to evaluate the manner in which we run our business. The hourly charge figure tells us that if we want to continue our current way of doing business, we need to double our hourly charge (from $30 to $60). In other words, our current business methods are not sustainable at the level of our economic goal. The $28.64 EHR, which is based on your economic goal, tells you what hourly rate you need to average over the 40-hour work week in order to meet your economic goal. This number is important because it is often a more achievable number. It is also an argument for abandoning the hourly rate method for the per-page or project-fee method of billing, because, unlike the hourly method, these methods reward you for productivity and efficiency. In my experience, it has been impossible to charge the hourly rate I would need to meet my economic goals. On the other hand, by analyzing my work habits, increasing my productivity and efficiency, and using a per-page/project-fee method of charging, I have been able to meet, and almost always exceed, my required EHR. There are weeks when I do not meet the EHR over the course of the work week hours, but those weeks are made up for by the weeks that I exceed my EHR. The EHR also serves as the standard against which I judge my business. I evaluate clients and projects based on the EHR. Clients whose projects regularly do not meet or exceed my EHR become ex-clients, because I know they cannot be made profitable. I am not in business to lose money or not meet my goals, which is why I rely on the EHR and review it constantly. Are you in business to lose money? Under your current setup, how do you know whether you are making or losing money, and if you are making money, how much you are really making? Your current charge of $30/hour is not enough to generate the desired gross annual income of $50,000 because your net EHR is $13.56 (based on 20 billable hours in a 40-hour workweek), not the required minimum EHR of $24.04. Your EHR is $10.48 too little. Based on your EHR, your gross annual earnings will be approximately $28,200, or a little bit more than half of your desired annual gross income. There are several options for curing this problem. First, increase the number of billable hours you work each week. At the hourly rate of $30, you need to generate at least enough work to bill for 34 hours every week for 52 weeks a year (or its equivalent). That will generate a net EHR of $24.06 ($30 × 34 hours = $1020 ÷ 40-hour workweek = $24.06). That is not impossible to do, but if you haven’t averaged at least 34 hours a week of billable-at-$30-an-hour-work over the course of a year in past years, you will have to devote some time, money, and effort to bring your workload to that level. Second, you could lower the amount of your desired gross annual income. That would certainly change the calculation, but it would raise other questions, such as: Are you earning enough to meet your bills? Are you earning enough to warrant remaining a freelance editor? Is your annual income sufficient to support the lifestyle you want? The third option is to raise your hourly rate to $51 an hour and continue to generate an average of 20 hours of work a week for 52 weeks, which would give you a net EHR of $24.06 and meet your income goals. The fourth — and best — option is to calculate the net EHR you need to meet, which is, in this case, $25 (it really is $24.06, but rounded numbers are easier to deal with and so we round up). Then, instead of trying to charge and collect an hourly rate of $50, charge a per-page or project fee and work to increase your efficiency so that you can generate your necessary EHR. It is more likely that clients will accept a per-page or project fee than an hourly fee that they view as too high or outside their budget. Also very important to consider when deciding whether to charge by the hour or the page/project is this: If you charge $3 per manuscript page, you need to edit a little more than 8 pages an hour to meet the $25 EHR. If you can edit 10 pages an hour, your EHR will equal $30, which is $5 more than needed. As time passes and that extra $5 adds up, you build a cushion for those times when you have no work, a cushion that may still allow you to maintain the EHR of $25 over the course of the year. Option 4 is, in my thinking, the best option because, as many freelancers have noted, publishers generally do not offer rates above $25 an hour, and authors aren’t knocking down doors in a scramble to pay editors $50 an hour. Most publishers offer a rate between $18 and $25 an hour; some publishers, to their discredit, I think, offer rates of $12 or less an hour. In addition, we are competing worldwide with editors who do not calculate their EHR needs and will accept work at any price offered. Consequently, the best way to charge is a per-page or project-fee rate because you can compete effectively yet increase your productivity and efficiency and thus raise your EHR to a sum much higher than the offered hourly rates — in other words, by becoming more efficient and speedy, you can make a $20 hourly rate (when converted from a per-page rate) an EHR of $50. Which brings us to the next matter: calculating a page. There are lots of ways to calculate a page. One of the most common formulas is 250 words = 1 page. But there are other formulas, such as counting characters. It really doesn’t matter what you decide equals one page; what does matter is that you have a definition, that you make it known to clients, and that you apply it before quoting a price. Regardless of how you ultimately decide to charge — whether by the hour, the page, the word, or the project — it is important to be able to calculate the number of pages because for most people, the number of pages has meaning as a measure. In addition, editors think in terms of how many pages they can edit in an hour, not how many words they can edit in an hour. In a recent online discussion, someone was looking for an editor to edit a 248,000-word manuscript that they said equaled 450 pages. Before bidding on such a project, you need to have a standard definition of what constitutes a page so that you can rationally determine what to bid. In this instance, the author calculated a page as 550 words, more than double the commonly used 250 words. Were I to bid on this project, I would bid as if the page count were 992 pages, not 450. One page equaling 550 words is not within my lexicon. If I placed a bid based on the 992-page count, I would be prepared to explain what constitutes a page and how I calculated the manuscript’s true (for editing) size. This count is important to me because I have a pretty good idea of how many pages I can edit in an hour. That number is a range that covers badly written manuscripts through well-written manuscripts. Knowing the correct number of pages by my definition of what constitutes a page and knowing how many of those pages I can edit, on average, in an hour, lets me knowledgeably decide if I can undertake the project and how much I need to charge. If the author insists that the correct page count is 450, my response would be that it doesn’t matter — this is my bid price for the manuscript as described, whether we call it 450 pages or 992 pages. What matters is that I have a definition for a page that I apply when calculating my fee. This is important because I charge by the page, not by the hour. I have a high EHR that I want to meet and a key to knowing whether I can meet that EHR is knowing how many pages I can expect to edit in an hour. The more pages I can edit, the higher my EHR. In contrast, if I charged by the hour, aside from the fact that my true EHR would be significantly lower than my hourly rate, it wouldn’t matter how many pages I could edit in an hour. I am being paid by time, not by productivity — and I will not be rewarded for being efficient or productive; in fact, I will be punished if I am efficient and productive because I will earn less (in gross) on the project. When I charge by the page (or by the project), I am rewarded when I am efficient and productive. Every time I exceed my required EHR, I am given a bonus. In contrast, if I charge by the hour I can never exceed my required EHR (and usually cannot meet it), thus I can never receive a bonus. I know the concept of EHR can be confusing, maybe even daunting, but combined with a firm definition of what constitutes one manuscript page, it is really the best way to determine what you should be charging. In Business of Editing: What to Charge (Part III), we will discuss tracking the EHR. The first response to that question, at least in the United States, is to take a look at the EFA (Editorial Freelancers Association) list of editorial rates. It does no harm to look at the rate schedule, as long as you recognize the failings of the schedule and do not rely on it for setting your rates. The EFA schedule of rates is based on surveys of EFA members. Consequently, the survey excludes data from the many thousands of nonmembers. More importantly, the portion of the membership that responds to the survey is just a small fraction of the EFA membership, which itself is but a miniscule fraction of the universe of editorial freelancers. There are other biases in the survey as well. Bottom line is that the EFA schedule of rates is a place to begin but not to stop. It should be reviewed then discarded. A problem with the query about what to charge is that the asker believes in a false assumption — that there is a “going rate.” There really isn’t a going rate in editing. It is true that many publishers pay similar fees for work, but if you look at what work is required, you will see that there is a great variance among publishers. In the case of authors, there is no rate similarity that is author imposed. Authors deal with editors on a one-to-one basis, and negotiate rate one-to-one. Publishers, in contrast, deal with many editors simultaneously and thus have company-established pay guidelines that they impose. Although there is no “going rate” per se, it could be argued that there is a de facto one because Publisher A will offer pretty much the same as Publisher B by way of compensation; only the amount of work demanded (i.e., services required for that pay) varies — and should be carefully looked at and incorporated into your determination of what to charge. Ultimately, any “going rate” has little meaning in the absence of it meeting your needs, which is the crux of the issue of what to charge. The most important factor in setting a rate is knowing what your effective hourly rate (EHR) has to be in order for you to make the income you need. We have discussed the EHR several times. The original discussion and explanation is found in Thinking About Money: What Freelancers Need to Understand. That article covered the surface of the EHR. The EHR gives you a better picture of what you are really earning. For example, if you charge $30 an hour but are able to charge and receive payment for only 20 hours of a 40-hour workweek, your “gross” EHR is $15 not $30. You need to account for all of the hours in a workweek. The gross EHR isn’t a “true” EHR because it accounts only for hours, but it is better than blindly choosing a number that sounds good or matches the rate of some other editor whose circumstances and needs are likely to be different than yours. Utilities are but one of the expenses that are attributable to your freelance business. Health insurance is another, especially if you had employer-paid health insurance before pursuing your freelance career. The point is that you need to identify all your freelance-related expenses and add them to the mix to determine what to charge. We are only using utilities as a cost here, but the deduction from the gross EHR would be the freelance portion of all expenses of maintaining your business, broken down into its hourly value, such as the appropriate portion of health insurance, other required insurance(s), telephone and Internet service, rent or mortgage, hardware and software, etc. In other words, the $13.56 in the example is still high. Once you have figured out your EHR, you need to determine your target gross yearly income. In reality, you will pick a number that you would like to earn and see if it is feasible. Let’s assume that your target gross income for a year is $50,000. That equates to a gross of weekly income of $961.54 (based on a 52-week year), which equates to a minimum EHR of $24.04 (based on a standard 40-hour workweek). Is the $30/hour rate you charge sufficient to generate your desired annual gross income based on your EHR? The answer and more in Business of Editing: What to Charge (Part II). The one thing every professional editor strives to produce is a high-quality edit. This is more difficult today than it was 30 years ago; client demands have made production of high-quality editing increasingly difficult. Yet there are “keys” to producing high-quality editing. The keys begin with the decision whether to take on a particular project. A few days ago, I turned on my computer to find five job offers waiting for me. I only accepted one. The one I accepted came with much less onerous demands than the others, which means that I will be able to provide a high-quality edit. The job I accepted asked me to suggest a schedule based on what the client wanted and the manuscript needed; the others gave me a fixed schedule. After reviewing the manuscript for the accepted job, I suggested that a nine-week schedule was reasonable. The other jobs were for much shorter manuscripts but still required at least a two-week and more likely a three-week schedule; the schedule on offer was one week with no flexibility. However, there were still problems that had to be addressed with what ultimately became the accepted job. For example, the references and how they were to be formatted. The author used what is for me a rarely seen style for the references: American Chemical Society style. If the manuscript had a handful of references, changing them to Harvard style would not be a problem, but the manuscript has a lot of references and there are a lot of stylistic differences between Harvard and ACS. The client wants the manuscript sooner rather than later, and so it was decided that because the author was consistent, we would use ACS style for the references. In contrast, a couple of the manuscripts that I rejected didn’t have a single reference style, but the predominant style would have required many hours of work to restyle to conform to the client’s style. Yet the client was unwilling to compromise. The keys to high-quality editing begin with the decision whether to take on a project or not. Many editors are simply thankful to be offered work and accept jobs without vetting them. This approach leads to a low effective hourly rate and questionable editing quality because it can be a struggle to meet short schedules — especially if the manuscript is not well written. Another key is ensuring that a project leads to a decent effective hourly rate and a profit. I have noted over the years that many colleagues take on a new project expecting it to go smoothly only to find that it does not. And when it does not, they are faced with the dilemma of ensuring a decent effective hourly rate versus the high quality of editing they prefer to provide. This is the eternal struggle — what to do when the compensation is inadequate. Of course, it is difficult to know in advance, even if you sample a manuscript, how easy or hard a manuscript will be to edit. But there are certain things one can look for as clues. I have found that authors who very inconsistent and sloppy with references are often the same with the main text, which means more editing work. I have also found that if I see a lot of Word’s squiggly red lines, which indicate possible misspellings, that a manuscript may be problematic. In this case, however, because much of what I edit is medical, I recognize that the built-in spellchecker will mischaracterize a word, indicating it is misspelled when it isn’t. This clue requires familiarity with the subject matter. Which brings us to yet another key: knowledge of the subject matter. It is not that the editor needs to be an expert in the subject matter, it is that the editor needs to be comfortable with the subject matter. In my case, for example, I stopped editing fiction after about 6 months of editing — more than 31 years ago. I stopped for several reasons, including to provide a high-quality edit I had to be able to keep a sharp focus on the novel’s text. What I found was that when faced with a poorly written manuscript, my focus would begin drifting and I would have to reread the same paragraphs perhaps multiple times. I also discovered that for me, nonfiction was both more interesting and more profitable. Fiction editing is difficult because it requires familiarity with a wide range of topics that I am not normally either interested in nor familiar with. I have never been particularly interested, for example, whether Bucharest’s weather is closer to that of London or New York City, but that could bin important in a novel whose action takes place in Bucharest. As a fiction editor, it was my responsibility to know whether or not the author’s description of Bucharest was plausible (actually, accurate). My fiction reading has always been limited; I tend to read vast amounts of nonfiction. Consequently, I was better “educated” about things that the nonfiction I was editing was concerned with than the fiction editing needed. The ability to recognize writing patterns is another key. Every author has a writing pattern and in a group of collaborating authors, one pattern dominates. Identifying early in the editing process this pattern leads to greater consistency and accuracy in editing, which can lead to higher-quality editing. When you can identify these patterns, you can take advantage of tools such as EditTools. These types of tools, if properly used, lead to higher-quality editing. The final key to be discussed in this essay is resources. Having the right resources available is important. For example, knowing that Garner’s Modern American Usage is the leading usage guide for American English is not enough; you need to have it available. Similarly, being told to follow a particular style manual by the client is of little use is you are not familiar with it and have it readily available. It does no good for a client to ask you to follow AMA style if the only style guide you can access and are familiar with is Chicago. It should be clear that many things go into producing a high-quality edit; consequently, a lot of things need to come together. Yet an editor’s skill is not just objective things such as available resources; the skillset an editor needs to meet client limitations and still produce high-quality editing is sharpened over years of education and editing. Knowing one’s current limitations is an important part of providing high-quality editing. The professional editor works diligently to minimize those limitations, and one way to do so is to knowingly evaluate an offered job by the keys to high-quality editing.